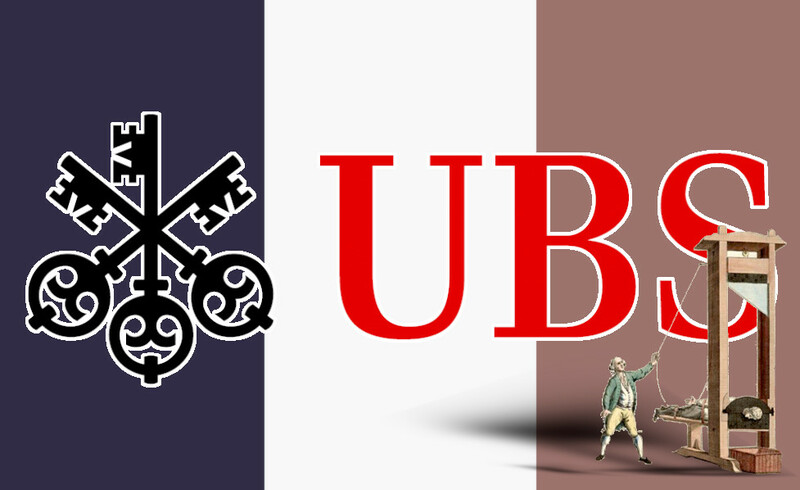 Swiss banking giant UBS has been hit with the largest fine in French history: €3.7b, the result of a 7-year investigation of the bank's role in helping the wealthiest French citizens hide €10b from tax authorities. The fine is more than ten times larger than the next-largest fine in French history, when HSBC paid €300m over its wrongdoing. The fine represents 92% of the bank's 2018 profits. After the financial crisis, Swiss law was changed to allow foreign tax authorities to pierce the veil of anonymity on Switzerland's notorious anonymous bank accounts. This allowed France's National Financial Prosecutor's office to investigate capital flows from France to Switzerland from 2004 to 2012, and to conclude that the bank and its directors "were perfectly aware that they were breaking French law." The bank's defense was that it had been duped by its French customers, who misled bank compliance staff by falsely claiming that they had declared their assets in Switzerland, but could not supply any details of which customers had so misled them. Instead, prosecutors showed that UBS had sent bank officials to gatherings of the super rich to court their business with promises of help to evade taxation, and that they had used a second set of books to track the money their clients sent to Switzerland, using the euphemisms "milk tickets" and "milk cans" to stand in for money. The record fine was also augmented with a €800m damages award to the French state, and a €15m fine for UBS's French subsidiary. Bradley Birkenfeld, a US-based internal whistleblower warned UBS about the money-laundering and was rebuffed; Birkenfeld later went public with his allegations, publishing a book called Lucifer's Banker: The Untold Story of How I Destroyed Swiss Bank Secrecy with details on UBS's wrongdoing. French prosecutors leaned heavily on Birkenfeld's revelations in their investigations. UBS has paid out some £7.7b in fines, settlements and penalties over the past 20 years and is still facing a potentially ruinous US investigation over its complicity in money-laundering for America's super-rich. UBS says it will appeal the French decision. The judgment also included several six-figure fines for individual executives at the bank. The timing of the judgment is critical: with less than two months to go until Brexit, the world's largest banks are on the hunt for a new financial capital where they will enjoy the unique mix of failed-state levels of oversight and industrialized nation levels of stability that London afforded them. France's court may have just cost Paris a future as Europe's new financial capital. While he wasn’t personally accused of any wrongdoing, UBS’s vice chairman of wealth management, Alain Robert, represented the Swiss lender at the Paris trial. Robert sought to rebut allegations that it was well-known inside the bank that the vast majority of French clients didn’t declare their Swiss accounts. “It’s up to the client, not the bank, to take responsibility vis-a-vis tax authorities,” he said during court hearings last year. Robert also took a swipe at former UBS employees who testified against the bank in statements made to investigators, saying they weren’t credible. That prompted a sarcastic remark from Presiding Judge Christine Mee. “There was maybe a quite serious hiring problem at UBS around that time,” she said.